Uticor Touchpanels were first introduced in 2001. They have since become one of the most popular brands of PLC operator Touchpanels, primarily due to their ease of programming and a very aggressive price point. 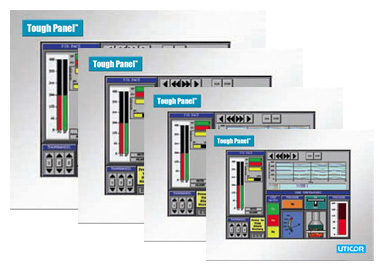 In January of 2005, the Uticor Touchpanel was recognized by six different magazines' readership surveys as the highest overall value PLC touchpanel in North America. We make an easy-to-use, simple operator interface that will save you a lot of engineering hours and design time due to its simplicity and ease of use. You don't need prior programming knowledge to design a screen. You do not need to attend any classes to learn how to program the Uticor Touchpanel. It is Intuitive, it is simple!